The Ola Grimsby Institute is a teaching institute for physical therapists with over a 40 year history of providing continuing education seminars, certification programs in manual therapy as well as exercise, Orthopedic Residency programs, Fellowship programs, and even a PhD program. The overall curriculum includes seminars in manual therapy, with a Norwegian origin and flavor, but a modern evidence-based approach to teaching and clinical practice. Additionally, the STEP (scientific, therapeutic, exercise progressions) curriculum, which is a progression of the Norwegian MET (medical exercise therapy), offers and advanced education in exercise design, dosage and progression. Our unique courses can be taken in series, leading to certifications, or as part of Residency and Fellowship programs. We offer a 1st year Orthopedic Residency program, a second year Manual Therapy Fellowship program and a 3rd year culminating PhD. Whether your interest are in acquiring a specific skill related to one course, or involve a true clinical education through our extensive manual therapy programs, we have the courses and instructors to meet fulfill your needs. The OGI consists of a team of instructors taught by, and brought together by, Ola Grimsby. Instructors have not only completed a minimum of 3 post-graduate years of manual therapy training, but also meet regularly to improve their skills in pedagogy. This highly motivated group is also supported by a larger team of clinical mentors that have completed our Fellowship program. Our programs are the result of a forty year dream of Dr. Ola Grimsby to create an academic and clinical residency curriculum for Physical Therapists in the United States. The process has included teaching and administration of the National Program for Orthopaedic Manual Therapy in Norway, studies of the multi-national schools of thought, and lectures throughout the world. Our faculty are highly qualified clinicians with broad experience in the many aspects of our profession. The founding members of the American Academy of Orthopedic Manual Physical Therapy. Professor Freddy M. Kaltenborn is pasing the OGI DMT practical exam in Utah. In 1984 Dr. Grimsby initiated the first residency program in the United States to be based on the IFOMT standard, and in January 1986 the first residents graduated from this program in Los Angeles, California. The students were examined by members of the Norwegian Board of Examiners and passed the test with a high standard of performance. The residency program was run as a full time endeavor in Charlotte, North Carolina. Five participants studied for two years under the instruction and supervision of the Norwegian Anders Myklebust who came to the US with his family for two years to teach the residency program. In 1989, Dr. Grimsby returned to the US to open an educational institute, which offered both a two and four year postgraduate residency programs for physical therapists. At the end of the first two year program the Norwegian Board of Examiners came from Norway and graduated the first group of residents. The next year the same examiners graduated students in Part I Manual Therapy. The first residents in the Part II dissertation/residency program also took their exam in Charlotte, North Carolina. Dr. Grimsby moved the headquarters of the new Ola Grimsby Institute (throughout the rest of the document known as the OGI), to San Diego in 1990, and their concept of a residency education rapidly gained popularity throughout the US. With consulting help from Dr. Eddy Miller, the OGI took on the task of acquiring national accreditation for our program. Since the Institute requires state approval for each location around the country where the program is taught, the bureaucracy and red tape presented a monumental challenge. A major breakthrough occurred when, in January 1991, the California State Department of Education granted OGI the right to issue a Master of Orthopaedic Manual Therapy Degree for the Institute Part I program. Another important event was the initiation of a monthly journal, Scientific Physical Therapy. Under the tutelage of OGI’s well-educated and motivated instructors, six residency programs graduated resident in 1991 in the following cities: Dallas, Denver, Salt Lake City, San Diego, Phoenix, and Seattle. These residents were examined by the members of the Norwegian Board of Examiners who this year traveled to all of the residency sites to conduct the written and practical exams. With the OGI continuing to grow and the Norwegian Board of Examiners repeatedly expressing satisfaction with the quality of the OGI residents, the Institute decided to take responsibility for the exam process. In 1992 the OGI Board of Examiners was established with Ola Grimsby as the chairperson. In March 1993, the Ola Grimsby Institute received approval from the State Board of Regents, System of Higher Education, State of Utah to grant OGI the right to issue Masters Degree in each state where the Institute conducted programs. 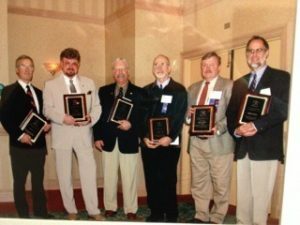 In addition, in 1992 the Institute established the OGI Competency Forum, an annual conference for residency students, graduates and instructors. Internationally recognized speakers would be invited to speak and instruct. Dissertation research reports produced by OGI’s own residency students. The conference includes social and cultural events that bond OGI colleagues together with a strong sense of loyalty and cooperation. The OGI has attained an international reputation, and in addition to co-teaching a residency program in Belgium, the Institute initiated a full time residency program in a Switzerland through Ivar Skjelbred. The 1994 Competency Forum awarded the “Hallvard” to Irvin M. Korr, Ph.D. at the annual OG celebration in San Diego. In 1995, OGI’s educational programs more than doubled in number of residents and organization grew stronger in a number of ways. In spite of our academic and professional achievements, we do not have all the answers. In humble admiration for the enormous potential of our profession, we challenge students to participate, to question, to learn and to share for the benefit of personal and professional growth and optimal patient care. The orthopedic manual physical therapy profession is in constant evolution. Models for explanations of our work are consistently undergoing fundamental changes; at the same time, explanations previously accepted within the discipline are now regarded as being incorrect. This situation illuminates the importance of reevaluating our clinical work while maintaining the best from the past and developing clinical abilities related to new evidenced-based knowledge. Furthermore, it is imperative to perform measurable therapeutic procedures to meet the demands of outcome studies in compliance with current healthcare reforms and evidence-based procedures. The American Academy of Orthopaedic Manual Physical Therapists (AAOMPT) was founded in Rochester, Michigan in 1991. Ola Grimsby was one of 8 Founding Fellows of AAOMPT. At the urging of Norwegian manual therapist, Freddy Kaltenborn, a group of leaders of various manual therapy residency programs met at Oakland University to discuss common issues facing manual therapy in the United States. AAOMPT was formed out of ther recognition of their common interest in advanced manual therapy in the United States. A primary goal of AAOMPT was to secure US membership in IFOMPT. The orginal 8 members included, Richard Erhard, PT, DC; Joe Farrell, PT, DPT, MS; Kornelia Kulig, PH.D, PT; Michael D. Rogers, PT, OCS; Bjorn Svendsen, DHSc, PT; Stanley V. Paris PT, PhD; Ola Grimsby PT; and Michael Moore PT became the Founding Fellows of the AAOMPT. The first officers were: President, Joe Farrell; Vice President, Richard Erhard; Secretary, Michael Moore; Treasurer, Ola Grimsby; and Member-at-Large, Stanley Paris.